In discussing post-game analysis in the Fritz “family” of playing programs (Fritz, Rybka, Shredder, Junior, and Hiarcs), as we’ve been doing for the last several blog posts, we need to also consider the important role of endgame tablebases (such as we find in the Fritz Endgame Turbo 3 package). What are tablebases? They’re special chess databases which contain every possible position of x material on the board. For example, the Queen vs. Rook tablebase file contains every possible position of King + Queen for one player and Rook + King for the other player. All of these positions are linked together with a very important result: a chess engine will play or analyze that endgame perfectly, completely error-free. Some players might ask, “Why can’t a strong chess engine do that anyway?” With simple endgames, many engines can do that. But as more material appears on the board, the proper path becomes less clear; some minor piece endings require precise technique. Many strong players (master level and up) will tell you that proper technique is paramount in many endings, and the whole reason for studying technique is to avoid having to look twenty or thirty (sometimes more!) moves ahead in an ending. There are numerous endgames in which a chess engine simply can’t look far enough ahead to reach a proper conclusion, and this is why tablebases are so vital – especially for post-game analysis. 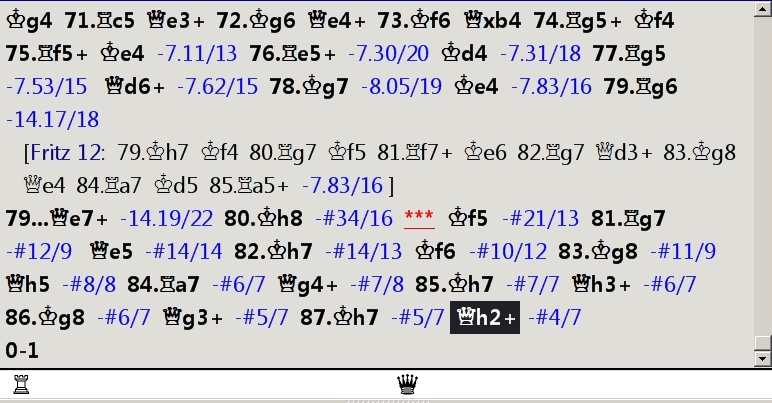 I watched for a while after I clicked the “OK” button to start the analysis; Fritz12, using endgame tablebases, took about two seconds to generate the analysis in the illustration above. The analysis in the illustration begins with Black’s 65th move, and each move is analyzed as ending with checkmate given best play for both sides. Same engine, radically different analysis. In fact, the analysis is less accurate – note that Fritz12’s analysis contains forced mates starting with White’s 80th move (instead of Black’s 65th move as seen in the first illustration). What was the difference between analysis sessions? In the second case, Fritz12 was analyzing the game without the use of endgame tablebases. I’ll reiterate here that the second set of analysis is less accurate. Using tablebases, Fritz12 finds a forced mate for White in twelve moves on move 80; without the use of tablebases, Fritz still finds a mate, but it’s a much longer one: 34 moves. 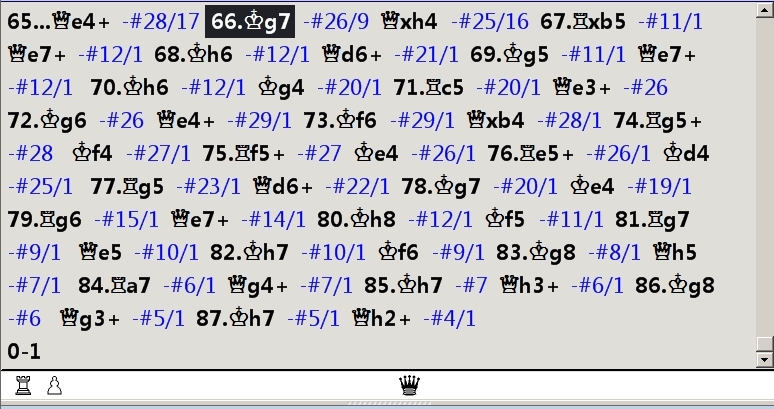 And in the second analysis Fritz, without tablebases, fails to find mate at all prior to move 80, while in the tablebase analysis a mate was discovered at every point from move 65 on. You’ll also recall that Fritz12 performed all of the analysis in the first illustration in approximately two seconds. The analysis which you see in the second illustration required eight minutes. Analyzing games without tablebases is not only less accurate, but also slower. Click the “Tablebases GUI” Tab, then use the “Browse” button to bring up a dialogue which lets you select the folder in which your endgame tablebases are stored. Then click “OK” to complete this part of the process. Now exit the Fritz program completely to make sure the software properly records and remembers this location. You should only have to do this once; the software should now remember where your tablebases are located from session to session. There are three ways to obtain tablebases; two are free, but are time-consuming and require some effort. One is to locate a program called TBGEN.EXE, which was a program that allowed users to create their own tablebases. It might be found somewhere online (though I was unable to locate one for download). You could also download tablebases; a Web search will turn up two or three sites from which the files can be downloaded for free. This could be time-consuming, though, as some of the files are quite large. 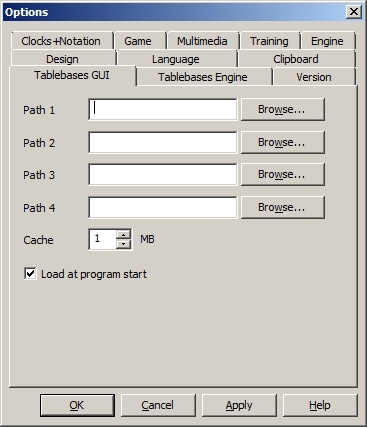 The third way to obtain the tablebases is to purchase one of the commercial DVD packages, such as Fritz Endgame Turbo 3, which not only include the tablebase files but an installation program as well. 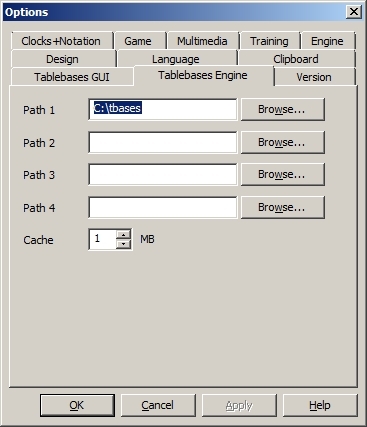 After you’ve downloaded or installed the tablebases, and then “pointed” your chess software to them as described above, your chess engine will use them automatically whenever needed.